Heat the butter in a large saucepan over a medium-low heat, add the onions and sweat gently until soft - don't let it brown. Add the cauliflower, potato and celery, along with 600ml water. Bring to the boil, add a little salt, turn down the heat, cover and simmer for 20-30 minutes until the cauliflower is perfectly tender. Add the milk and liquidise until very smooth. Taste and season with nutmeg and pepper. When ready to serve, reheat the soup until piping hot. Meanwhile, liquidise the Stilton with the cream and chives (saving a few for a garnish) and a ladleful of the hot soup; taste and season. 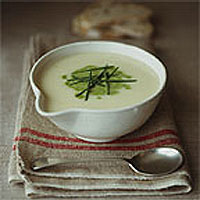 Serve the soup in bowls, topped with a swirl of the cheesy green cream - an elegant contrast of flavour and colour. Finish with sprig of celery leaf and a few snips of chives.